Just as it was the Northmen who, by imposing order on Europe’s eastern frontier in the second half of the first millennium, stiffened that frontier and made Russia a White racial bulwark against the non-White hordes of Asia, it was also the Northmen who, in the same era, pushed Europe’s western frontier westward across the great, unknown Ocean Sea, opening up new lands for settlement by succeeding generations of our race. German in language like the Goths and the Anglo-Saxons, the Vikings retained other aspects of Germanic culture which those earlier emigrants from the Nordic heartland had already lost by the dawn of the Viking Age. In particular, the Vikings held to their Indo-European religion and world view longer than any of the other Germanic peoples. They also remained hardier, fiercer in battle, and more venturesome than those who had been softened by the more civilized living to the south. A tenth-century Viking narrative poem, Rigsthula (Song of Rig), provides a fanciful account of the origins of the Scandinavian population. In it a traveler named Rig (i.e., “king”) is given lodging at three dwellings. At each he manages to impregnate the woman of the house before he leaves, thereby fathering three sons. The first woman is old and wrinkled, and she dwells in a hovel. The son she bears for Rig is dark, stooped, and ugly. He is named Thrall, and from him is descended the race of serfs and slaves, the hewers of wood and the carriers of water. The second woman is younger, better looking, better housed, and more industrious. Her son by Rig is a sturdy, light-eyed boy, and is given the name Karl. From Karl is descended the race of free peasants and craftsmen. The third woman is young, tall, blond, and lovely, and the house in which she lives is large and magnificent. She bears Rig a son who is strong and straight of limb, white of skin, fair of hair, light of eyes, and quick of mind. He is named Jarl (Earl), and he quickly learns the magic of the runes and the mastery of weapons. He hunts, rides, fights, and fears no man. From him is descended the race of kings and lords of the earth. Rig himself is identified with the Norse god Heimdall, the whitest of all the gods and the father of all mankind. Rigsthula reminds us of the ancient Aryan religious work, the Rigveda, which, more than 20 centuries earlier, also gave a fanciful account of the origins of the races. It is clear that Rig’s descendants via Thrall represent the dark, round-headed element in the Scandinavian population, and that this element was at some time in the past held in a servile status by a largely Nordic ruling class. In any event, by the dawn of the Viking Age a general mixing had taken place. Thralls may still have been darker, on the average, than the free farmers or the nobility, but one could find Nordic slaves, largely the consequence of the Viking policy of enslaving prisoners of war, and one could also find darker elements among the wealthy and powerful, as evidenced by the names of such leaders as Halfdan the Black (ninth-century king of a Viking realm in southern Norway). By far the dominant racial element among the Vikings, however, was Nordic. To the north of the Northmen, in Norway, Sweden, and Finland, were the Lapps, a very primitive race which lived a nomadic life and gained its sustenance primarily from the reindeer of the forest and tundra. The sixth-century historians Jordanes and Procopius describe the Lapps as being culturally little above the beasts on which they preyed. Both racially and linguistically the Lapps were closely related to the Finno-Ugric tribes to the east. They were short, predominantly dark (although today some Lapps are blond, apparently having absorbed Nordic genes), broad-nosed, and extremely round-headed. They were certainly partly, and perhaps wholly, responsible for the dark element among the Vikings, although there was little mixing between Vikings and Lapps during the Viking Age, because of their entirely different lifestyles. The mixing must have taken place during the prehistoric period, perhaps shortly after the proto-Germans arrived in Scandinavia and before they had driven the ancestors of the Lapps further north. Their loyalty and sense of community seldom extended beyond the fighting band to which they belonged—or, at most, to that limited region of Norway or Denmark or whatever which they considered “home”—and they would as gladly, or almost as gladly, hew down the Vikings of a rival band as a monastery full of trembling priests in some southern land. Within the band, however, the Viking ethos demanded a solidarity as uncompromising as that of the other Germanic peoples of their time. The number of ships increases; the endless flood of Vikings never ceases to grow bigger, Everywhere Christ’s people are the victims of massacre, burning, and plunder. The Vikings overrun all that lies before them, and none can withstand them. They seize Bordeaux, Perigueux, Limoges, Angouleme, Toulouse; Angers, Tours, and Orleans are made deserts. Ships past counting voyage up the Seine…. Rouen is laid waste, looted, and burned. Paris, Beauvais, Meaux are taken; Melun’s stronghold is razed to the ground; Chartres occupied; Evreux and Bayeux looted; and every town invested. Just as in England and Ireland, however, Vikings who at first came only to seize women and gold later came to seize land as well. This process reached its climax early in the 10th century when a Viking band wrested away from the West Franks a substantial piece of territory in northwestern France, south of the lower Seine. In 911 the Frankish king Charles the Simple, the great-great-grandson of Charlemagne, gave legal sanction to this conquest by recognizing the Viking leader Ganga-Hrolf as his vassal and confirming the latter in the ownership of the land which his band had already seized. Ganga-Hrolf (i.e., Hrolf the Ganger or Ralph the Walker, so named because he was too large to be carried by any horse), called Rollo by the French, in turn submitted to baptism and settled down to the task of enlarging and consolidating his domain. He was the first Duke of Normandy, as his land came to be known, after its Nor(se)man conquerors. First White American. In the year 986 the Viking Bjarni Herjulfsson, sailing from Norway to Greenland, missed his intended destination and instead found himself off the coast of a previously unknown land: North America. Bjarni did not land, but he carried the news of his sighting back to Greenland. Leif, the son of Eric the Red, bought Bjarni’s ship from him and set out to see the new land for himself. He established a small settlement at a place he called Vinland, on the island of Newfoundland, but he only spent one winter there. Unrelenting attacks by Indians—Skraelings to the Vikings—made life very difficult for Thorfinn’s American colonists, however, and after three years they abandoned their settlement and returned to Greenland. Had the Vikings’ weapons been technologically superior to the bows and arrows of the Skraelings—as Columbus’ firearms were—then White history in America would have begun 500 years sooner than it did. As it was, the individual superiority of the Viking warriors in battle could not make up for the enormous numerical advantage enjoyed by the hordes of Red men who opposed them. In 1962 archaeologists excavated the ruins of what is believed to have been Straumfjord, near the present Newfoundland village of L’Anse aux Meadows. In Greenland too, with is utterly inhospitable environment, the Viking presence did not last. Initially there were no hostile Skraelings in Greenland—in fact, the first Eskimos did not arrive on the island until nearly 400 years after the Vikings—but the total lack of trees, metal ores, and other natural resources, together with the scarcity of farmland, kept the White population down to a maximum of 3,000 persons, scattered among some 300 farms. Ironically, it seems to have been piracy which was the undoing of the Greenland Vikings. Although they were Christianized shortly after the year 1,000 and gave up their warlike ways and the raiding of other lands for gold and women, there was still a strong demand for blond slave girls in Moorish Spain and North Africa and in the Turkish lands to the southeast. The demand was met by pirates recruited in England and Germany by Jewish middlemen, who began raiding the island settlements of the North Atlantic in the 14th century. Purest Cultural Heritage. Iceland—which suffered its last attack by White-slaving pirates as late as the 19th century—and the other Viking islands survived the raids, but Greenland did not. Racially, Iceland does not present quite as pure a picture as one might wish, for the ninth-century Viking settlers were not all jarls and karls; they brought their thralls along with them as well. Despite this lapse, their descendants today are biologically closer to the original Viking stock than the population of any other country. This racial quality is reflected not only in the tallest average statute in the White world, but in the highest literacy rate (100 per cent) as well. Not only do all Icelanders read and write, but a far higher proportion of them are authors than is true for any other country. And, despite her tiny population, which is able to support only a single university, Iceland is able to boast a larger per capita Nobel Laureate quota than any other nation on earth. Even where we must use extreme caution in drawing historical data from the sagas, they give us a clear and unambiguous picture of the Viking ethos and the Viking world view, of Viking attitudes, beliefs, feelings and temperament. Fortunately, when it is Norse history we want we have the records of the Vikings’ literate Frankish and English cousins to supplement and clarify the semi-legendary material of the sagas. From these records we can also gain a good deal of insight into some of the external forces and circumstances which raised the curtain on the Viking Age in the eighth century and then lowered it in the 11th. One of the forces was certainly the tide of Christendom which was rising over Europe from the south during the eighth century. The Franks had become Christianized during the sixth century, after their king, Chlodwig (Clovis), accepted baptism, but the Saxons, the immediate neighbors of the Northmen, rejected the alien religion from the Levant and held to their ancestral ways, as did the Northmen themselves, of course. Genocidal Evangelism. Beginning in 772, a year after he became sole king of the Franks upon the death of his brother Carloman, Karl, later known to the French as Charlemagne, son of Pepin the Short and grandson of Karl the Hammer, waged a 32-year campaign of genocidal evangelism against the Saxons. The campaign began with Karl’s destruction of the Irminsul, or World Pillar, the Saxon equivalent of the Norse World Ash, Yggdrasil, located in the Saxons’ most sacred grove, at Eresburg (on the site of the present Marburg), and it became bloodier, crueler, and more intolerant as it wore on. Karl’s savagery reached a peak in the tenth year of the evangelism: in 782, at Verden on the Aller, with the blessing of the Church, he had 4,500 Saxon nobles beheaded. Twelve years later, in 794, he introduced a policy under which every third Saxon was uprooted from his land and forced to resettle among Franks or other Christianized tribes. Fairly early in this campaign, in 777, one of the most prominent of the Saxon chieftains, Widukind, took shelter among the Danes and appealed to their king, Sigfred, for assistance against the Franks. Although the Danes were wary of becoming involved in a full-scale war against the formidable Karl, they and the other Northern peoples were put on their guard, and they became increasingly indignant over the Frankish suppression of the Saxons’ religion. Karl’s brutal campaign against the Saxons undoubtedly helped raise a certain consciousness in the North of the spiritual and cultural differences which separated Scandinavia from those lands which had fallen under the yoke of the Christian Church. The internal forces leading to the eruption of the Vikings from their Northern fjords were even stronger than the external ones. Among the former was a very high birthrate specifically among the most active and aggressive of the Northmen, the result of their customary practice of polygyny. According to the 11th-century German ecclesiastical historian, Adam of Bremen, every Swede of more than average substance kept two or three wives, while the nobility had no limit to the number of women they allowed themselves. For example, Harald Fairhair, the Norwegian warrior who unified Norway in the ninth century and became its first king, had as many as 40 sons by some accounts, at least nine of whom are known to history; and Harald’s son Erik Bloodaxe had at least eight sons who grew to manhood. In the capitalistic South such a practice may have meant only that the cleverest and crookedest paper-shufflers—i.e., the richest men—would have more progeny, on the average, than honest workingmen, but in the hard living North, where every man’s mettle was tested almost daily by his environment and by his fellows, it was marvelously eugenic: the strong, the able, and the aggressive had proportionately more children than they would have had in a monogamous society. Another interesting eugenic contrast between North and South is provided by the Christian practice of clerical celibacy. Although there were many periods during the Middle Ages in which violations were commonplace, as early as the fourth century the Church began insisting on total celibacy for the higher clergy. With the growing incidence of monasticism after the sixth century, a greatly increased portion of the population of Christian Europe was subjected to the rule of celibacy. In the Middle Ages the clerical life was not, as is often the case today, simply a refuge for those who could succeed at nothing else; it was usually the only route to scholarship—and often the only route to literacy as well—and it attracted many able and intelligent men, whose genes were then lost to their race. For a thousand years, until the Reformation, there was a selective draining away of Christian Europe’s intellectual vitality. A Mighty Hive. The high birthrate among the most active and energetic elements of the population in the Northern countries led to land-hunger and the drive for external conquests. In the words of 17th-century English statesman and writer Sir William Temple: “Each of these countries was like a mighty hive, which, by the vigor of propagation and health of climate, growing too full of people, threw out some new swarm at certain periods of time that took wing and sought out some new abode, expelling or subduing the old inhabitants and seating themselves in their rooms.” This state of affairs also held long before the Viking Age, of course. In addition to the generalized effects of a high birthrate, two other consequences of polygyny which bore on the rise of viking as a way of life were the large numbers of second, third, fourth, and later sons in the families of Norse landholders—sons left without inheritance and without land, unless they could wrest it away from someone else—and a shortage of women. The political consolidation which began taking place in Scandinavia in the ninth century served as an especially strong impetus to Viking colonizers. As mentioned earlier, the Vikings were extremely individualistic, extremely resentful of any encroachments on their freedom of action. After Harald Fairhair won a great sea victory at Hafrsfjord over the Viking chieftains of western Norway in 872, many of them left Norway with their households and their followers and settled in Iceland and the smaller islands of the North Atlantic rather than submit to Harald’s rule. A century later, political consolidation having been achieved, Scandinavian monarchs began to realize the policy advantages in bringing their people into the same religious camp as their neighbors to the south. The first to take the step was Denmark’s Harald Bluetooth, son of King Gorm the Old. In 965, fifteen years after Gorm’s death, Harald allowed himself to be baptized, and then he undertook the forcible conversion of the rest of the Danes: a move which did not sit well with many and led to further emigration and turmoil in the North. It also led eventually to Harald’s deposition and banishment. The Last Viking. 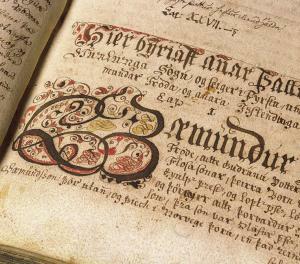 The coming of Christianity to the Viking world eventually meant the end of that world, but it did not change the Viking ethos immediately, as is evidenced by the life of a man who was certainly one of the most remarkable of all the Vikings, and the last of the truly great ones: Harald Sigurdsson, who, after he became king of Norway, was also known as Harald Hardraada (Hard Ruler) and Harald the Ruthless. His deeds are the subject of one of the most fascinating of the Viking sagas (King Harald’s Saga), which we would be inclined to dismiss as an unusually imaginative work of heroic fiction, were it not solidly confirmed by the historical record.